Just hours after we reported that the Fifty Shades of Grey sequel Fifty Shades Darker is set for release in February 2018, Universal Studios Home Entertainment has released a photo from the sequel's teaser, which can be found on the Blu-ray and DVD release of Fifty Shades of Grey on May 8. 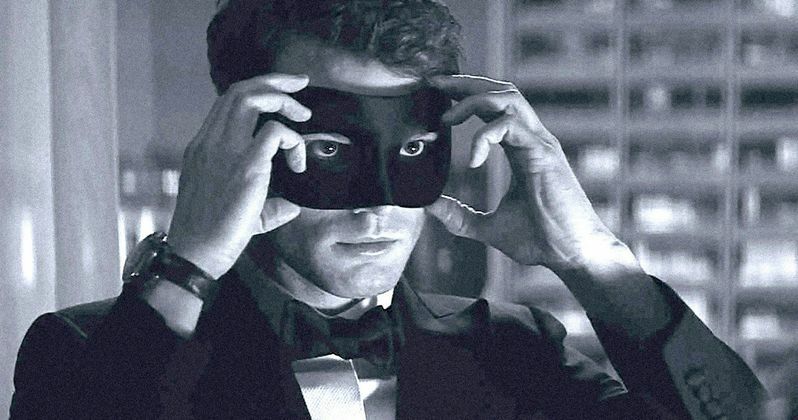 The photo features Jamie Dornan's Christian Grey trying on a masquerade mask. Since production hasn't even started yet on Fifty Shades Darker, it isn't known when this teaser was even filmed, but you can check out the entire scene in just a few weeks. If that wasn't enough, we also have a new Blu-ray trailer where Dakota Johnson (Anastasia Steele), Jamie Dornan (Christian Grey), director Sam Taylor-Johnson and author E.L. James share their thoughts on this adaptation. The most talked about movie of the year Fifty Shades of Grey, starring Dakota Johnson and Jamie Dornan, arrives on Digital HD Friday, May 1st and on Blu-ray Friday, May 8th from Universal Pictures Home Entertainment. The release features more than two hours of bonus content including an exclusive tease of FFifty Shades Darker, an Unrated Edition of the film and an Alternate Ending.